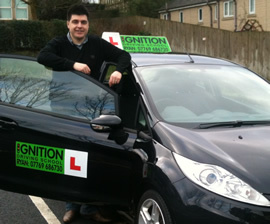 Taking driving lessons in Colne couldn't be easier with our local, fully qualified driving instructor Ryan. Ignition Driving School will help you throughout your driving lessons Colne by giving you access to our FREE online pupil centre, The Hub. If you are working towards your theory test then look no further as at The Hub you can practice theory papers and hazard perception clips for FREE. You can also refresh your memory about driving lesson topics too, meaning you have lots of support at your fingertips. Your local driving test centre is in Nelson and Ryan is very experienced in the driving test areas around Nelson and will ensure that your Colne driving lessons are focussed around these areas. Ignition Driving School takes learning to drive very seriously and you can be sure that all your driving lessons will be on an individual basis, with no back seat passengers, and will last the full length of time that you have requested. At Ignition Driving School, an hour driving lesson really does mean an hour! Some people wish to learn to drive at a faster pace and if you wish to take an intensive driving course then we have various packages available. Intensive driving courses start from £280 for a practical driving test and 10 hours worth of driving tuition. For more information please click here. Learning to drive with Ignition Driving School was a fantastic experience. I thoroughly enjoyed my driving lessons. My instructor Ryan Meachin was very helpful and easy to understand. I would recommend Ignition Driving School to anyone learning to drive. The quality of teaching is outstanding. The price of lessons is also reasonable and affordable. I was very impressed with the quality of driving lessons I received with Ignition Driving School. I thoroughly enjoyed my experience with Ignition Driving School. I cannot praise my instructor enough, he was absolutely fantastic! Gaining my licence was massive for me, not only to give me my freedom but to progress in my job also. I just wish I'd have done it sooner! Thank you so much, I am so grateful! Couldn't recommend highly enough! To help you move on from this page, the quick links tabs at the bottom and on the right hand side will help you on your way. If you require any further information please feel free to use the enquiry form or you can call us on 07900 431516 or 0800 002 9278.